Whoa, I didn't realize that it has been almost a whole week since I last posted! My head is so caught up in work and moving, I have not been keeping up with other things. In fact, my head is a little too caught up because I have done some silly things lately. Like putting a sliced tomato in a sandwich bag in the knife drawer instead of the fridge. And not putting the deli meat and cheese in the fridge but instead putting it away with the bread; thus having to throw it out the next day. (Not so happy about that one.) I am usually not so scatterbrained, but I am moving across the country soon so I am cutting myself some slack. Let's just hope that I don't screw up the important stuff. 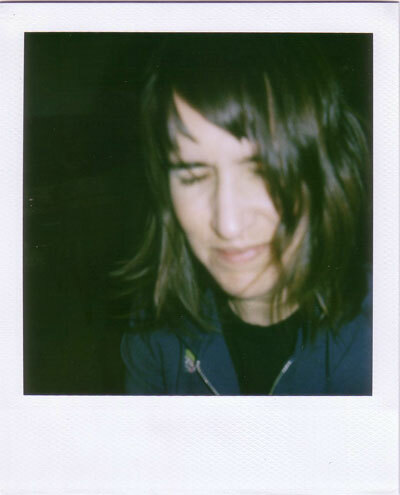 Over the weekend, I posted some Polaroid self-portraits to Flickr and then decided to see if there is a group specifically for Polaroid Self-Portraits. To my great surprise, I could not find such a group! So I started one. I'm usually not good with group stuff, but so far so good. There are already many great self-portraits posted to the group; you should check them out. And if you like Polaroid photography and self-portraits, you should join the group!! I am really excited about it and hope that everyone continues to post to the group. Also on the Polaroid front, you should check out Pola-Fiction, a Polaroid/writing project by Tod Brilliant. He's chosen 50 of his favorite Polaroid photographs and he is using each one as a starting point for a story. And he is writing the stories on an old typewriter. I’ve selected fifty of my favorite Polaroid pictures that I’ve taken in the past few years. Using each as a ’seed’ I will pen a small story and post it here. Most likely, this will be at the rate of one story every few days until I’m done. Writing on a typewriter is quite different for me compared to say, using a computer. It’s slower, more methodical and definitely more maddening. No cutting and pasting, no easy spell checking. For these reasons, and perhaps due to the more contemplative nature of sitting outside with a typewriter, I’ve noticed that my Hermes 2000 efforts have a different tone, a different voice. I don’t know it it’s better or worse (yet), but it sure is something new. Such a fantastic idea! And so far I've quite enjoyed the stories. Returning to the topic of moving, we have about a month left in Pittsburgh. I am so excited to soon be heading to the sunny southwest, but at the same time, I can't believe I am leaving Pittsburgh! There are so many things I love about this city and I've spent nearly 10 years of my life here. New Mexico is home, but so is Pittsburgh. I know I've touched on this before and it never comes out right...I have such a great love for this place. And in that love there is some bitterness, but eh, life's always got it's thorns. This place and the people here have had a huge impact on my life, positive and negative, and leaving...well, it feels like an end of an era. It makes me feel sad. It makes me feel relieved. It makes me want to hug people and tell them how much they mean to me and say come visit, please. And it makes me scatterbrained. Okay, being that's it's Tuesday, I will leave you with my Flickr faves from the past week. jonnodotcom's Lola. Cannot resist a great cat portrait. That look! kat19901991's Self-portrait in red dress. Amazing Polaroid transfer! full*instrumental's hanging out. Never can resist the bird photos. This one is amazing AND it's in Albuquerque! !